Animation is like a lion on the Serengeti: alluring, fascinating but also pretty intimidating. There’s plenty of interest in this profession and the industries associated with it for good reason: it’s one of the coolest jobs going. So because we love you lot so much, this week we’ve done our utmost to answer some of the most frequently asked questions in an effort to demystify animation. Let’s crack on. Where can you work in animation? We get it, TV and film is the obvious draw for many of you who are curious about the profession, but it’s by no means the only path to becoming a successful animation professional. Video game design and development is a big sector and ever-growing and corporate animation will always be relevant and lucrative. There are also exciting opportunities for animators in architecture, medical, advertising and education. As animation and the tools we use to create it become easier to use, more powerful and more widespread, the number of areas that we can work are expanding, there’s never been a more exciting time to be an animator! The bare minimum is a mid-range computer (or something a bit beefier if you have your heart set on 3D animation) and some animation software. If you’re a complete degenerate I suppose you could try animating with a mouse, or worse: a trackpad, but for the more artistic aspects of the animation process like character creation, storyboarding, background design etc. this is going to be torture. If you’re serious then a tablet and stylus is the only way to go. We’re big Wacom fanboys and girls in this studio, their Intuos range is a great place to start. There are some great free/cheap animation tools out there which can get you started on your way – give Synfig Studio or Adobe Animate CC a go for 2D, and Blender for 3D. It can be tough, isolating, competitive and repetitive, but that’s exactly why you need to have a passion and a love for what you do. Animation is also immensely rewarding and inspiring. It gives you a chance to be creative and remain on the forefront of technological development; the people are amazing and with the entertainment industry, it’s always interesting. Do you need a degree to be an animator? An animation degree in itself isn’t a golden ticket into the animation industry, but what you learn during the course of a degree can be instrumental in getting you hired at the big studios you dream of or standing out as a freelancer. For example, the networks you create as well as the feedback you get from your mentors and your peers are hard to mimic outside of formal education. You get the chance to build up a great portfolio and it instantly proves to potential clients/employers that you have a baseline of knowledge and skill. That being said, there are plenty of very successful folks in the industry who don’t have an animation degree. Stephen Silver, designer for big shows like Kim Possible and Danny Phantom is self taught, he actually started out as a caricature artist in shopping malls! How do you make a great animation portfolio? 30-45 seconds. Chances are, the person looking through your portfolio has a long list to get through and has watched hours of portfolio footage in their time, keep it snappy and be ruthless with what makes the cut. Simple to navigate. Stick to Vimeo. Multiple short clips. These will keep the viewer’s attention with their momentum and variety, giving you the opportunity to show off the different styles and mediums you’re great at. Drama/ acting, characters expressing emotion or a change of emotion. Movement, something dynamic and technical – just please no bouncing balls or people picking up boxes, they’ve been done to death and they reek of inexperience. Character animation. A chance to show off your skill, imagination and creativity as a designer, perhaps a series of clips showing the design process. Perspective. Something realistic, showing off your eye for detail and your ability to do more than just character work. Don’t skimp on the music. Make it something positive or inspirational with no lyrics and a precise, predictable beat which you can map your edits to easily and effectively. You’ll get hired in no time. Do you need to know how to draw to be a good animator? Not necessarily but it certainly helps, especially if you’re working for a smaller studio where lots of jobs in the animation pipeline are your responsibility. Design, character creation, storyboarding and other artistic elements of putting an animation together will be impossible for you if you can barely cobble together a stick person. 3D animators or stop-motion professionals can get away with limited drawing skill, however, in such a competitive industry, those who can draw will likely be snapped up before those who can’t. Fortunately, there are loads of roles in an animation studio that don’t involve drawing, so it’s not the be-all end-all. What kinds of jobs are there in a typical animation studio? Producer – The boss of the studio who has to contend with the budget, scheduling, sourcing of materials/software/hardware and making sure that the project keeps developing creatively and efficiently. Animation Director or Creative Director – This is Dan for us! The co-ordinator of all the creatives essentially. They ensure that the project meets the scheduling and budgetary requirements demanded by the production team and still comes out with the levels of quality, style, continuity and technical aspects necessary. 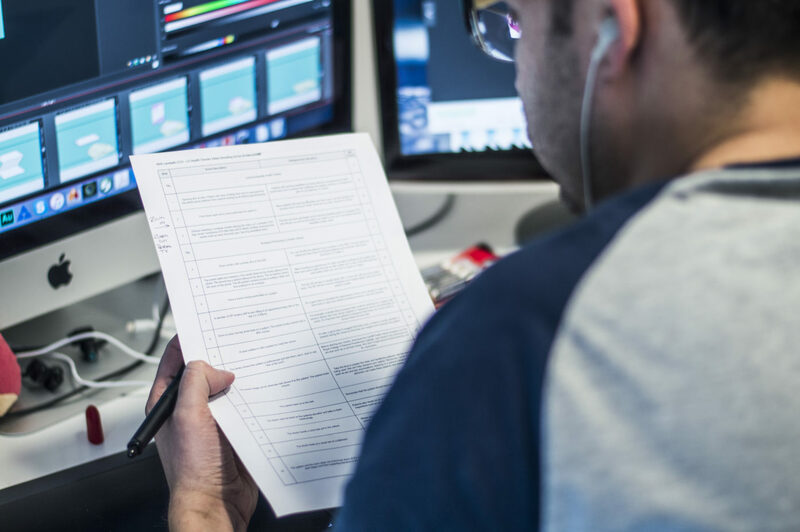 Scriptwriter – Writers and editors will work closely with directors, clients and vocal talent during production from before even the storyboarding phase to nail down the dialogue. Character Designer/ Developer – This is a job for the truly creative people out there: devising the characters that you’ll see in an animation, sometimes all the way through concept creation to assisting in the modelling process. Storyboard Artists and Assistants – Responsible for sketching out, shot by shot, exactly how they want the animation to look. Texture Artists and Digital Painters – They use an arsenal of hair, scales, wrinkles, freckles, moisture and other textures to ‘texture map’ or wrap these textures around the meshes and models to give them depth, complexity and realism. Lighters or Lighting Technical Directors – They make sure that the lighting, mood and colour balance is consistent throughout a shot or a scene. Inbetweener – the people who literally provide the poses in between the key poses of an animation sequence to aid the illusion of movement, a great entry point to animation. Compositor – The brave souls who bring everything together at the end of a project. Their job often involves making sure levels are consistent, adding motion blur, matching colours, finishing shadows, rotoscoping and keying where necessary. Where do you find inspiration for your animation? There you have it, the animation FAQ. Still got some burning animation questions for us? No sweat, just give us a bell or email us for a chat.